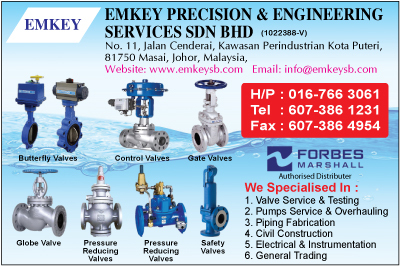 Emkey precision and engineering services was incorporated in Malaysia on 6th April 2007 under Companies Act with a paid-up capital of RM350,000.00 and Authorized Capital of RM350,000.00.Recently the company was incorporated as Private Limited Company on 25th October 2012 and named as Emkey precision and engineering services sdn bhd with the authorized capital of RM100,000.00. Presently, the company employees are total of 6 permanent staff including management team, clerical staff and technical staff. The company's main office is located at No.16, Jalan Gunung 5, Bandar Seri Alam, 81750 Masai,Johor Bahru. Previously, our main office located at No.9, Jalan Gunung 7,Bandar Seri Alam,81750 Masai, Johor Bahru. Here also located our workshop equipped with necessary machinery and equipment to carry out the job. To provide a work force challenged by today's technology and eager to respond to the ever-changing requirements of our customers. Fabrication & Repair All Kind of Industrial, Structural Welding & Sus Works, Engineering Works, Gear Wheel & etc. Servicing & Repairing, Air Compressor & Parts. Pumps Servicing, Mech /Seal, Pipe fabrication, Tig Argon Welding. The Manufacturer & Suppliers for Precision Tuning, Milling and Grinding Of Industrial Parts. Grinding and Polishing Industrial Roller.